Core networking code rewritten, should improve speed and stability. 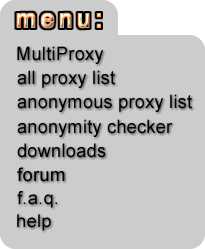 Proxy list import bug fixed. Ability to disable individual or group of proxy servers. Network activity indication by taskbar icon animation. Proxy server latency is updated real-time now. Default port changed to 8088. Several minor fixes.